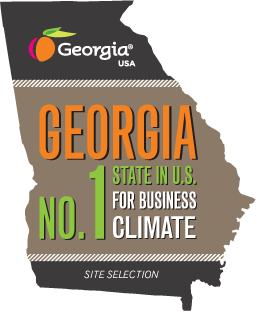 to bring your business to Jenkins County, Georgia. 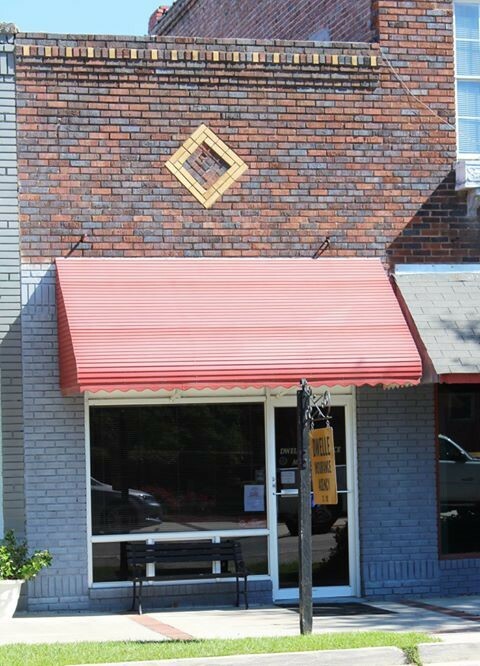 When you’re traveling through downtown Millen, Georgia, look for the special QR code (square bar code) displayed on some of the buildings. With a QR code reader app on your phone, you can scan the code to pull up more about the history of the building: when they were built, who or what businesses occupied it over the years, and more. 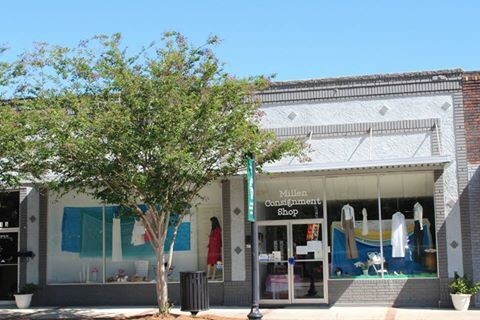 Or click on any of the images below to explore the history of downtown Millen. John Brooks opened this 1946 building as Brooks Chevrolet after WWII. Originally, R.G. Ellison’s Texaco gas station had been on the corner. Typical of gas stations of the time, it had a gravity fed hand pump for the gasoline. Keith Lee Chevrolet and Jarrard Chevrolet followed Brooks. The building is now empty. This complex of buildings was once home to Sparks Ford Motor Company, Builders Supply owned by C.B. Landrum and later his son Bill, Sharpe Implement Company, Bo Ginn's office, and The Millen News. The Millen News was established in 1903 and was located in the Lane Building on Winthrope Avenue and later in the Hotel Estelle. 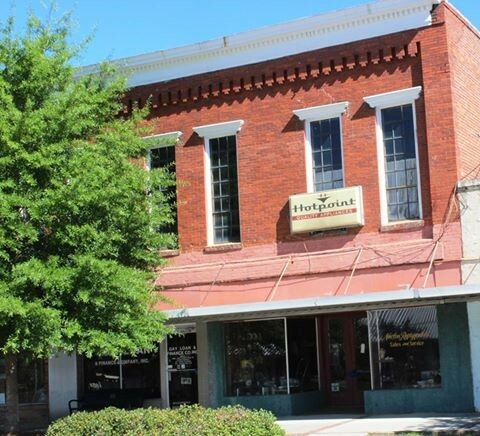 The most recent editor and publisher that some Jenkins County citizens will remember were Walter Harrison, editor, who was in the first store front, and Frank Edenfield, publisher, who was in the second store. Harrison and Edenfield ran The Millen News from 1946-1985. Frank Edenfield was owner and editor from 1985-1998. Allen Smith was editor from 1998 until Deborah Bennett took over in 2000. She continues as editor today. In 1998, Frank Edenfield sold The Millen News to The True Citizen of Waynesboro, Roy Chalker, Jr., owner. In November 2001, The Millen News moved from 815 Cotton Avenue to its present location at 856 Cotton Avenue, where the paper continues to serve the citizens of Millen and Jenkins County. For a more complete history of The Millen News, see The History of Millen and Jenkins County by Patricia Fries Hilliard, 2013. 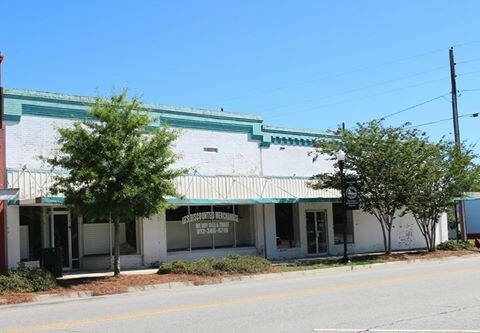 The buildings are now owned by Harold Moore and house Yesteryear’s Fine Used Furniture and Daniel’s Cleaners. This building that houses Dwelle Insurance Agency was built in 1928 as part of the Economous building. Before Dwelle Insurance moved in, Sim’s Grocery and Carter’s Jewelry Store were there. Bobby Dwelle worked in Sim’s when he was young. 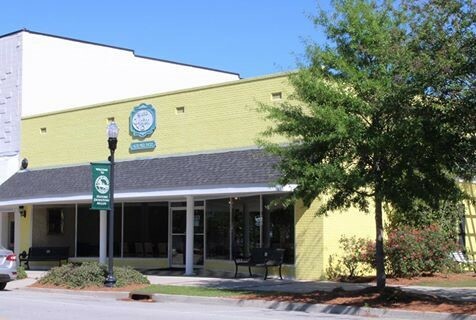 Mr. Dwelle bought Johnston Insurance Agency in 1953 when it was located at 106 Daniel Street and operated it there until 1979 when he moved the agency to its present location at 621 Cotton Avenue. The Dwelle family continues to operate the insurance company. Several different storefronts have been in this 1910 building. 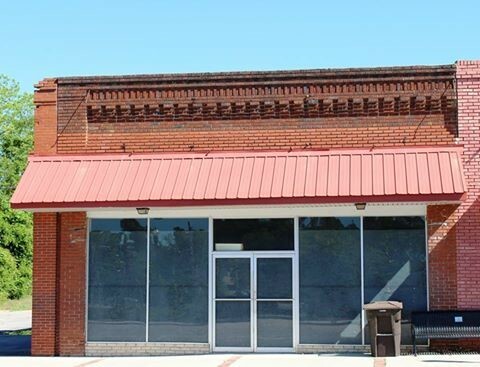 In earlier years it was home to grocery stores (George Lightfoot Grocery, Fred Stephens Grocery), fish markets (Harris Fish Market), appliance stores (Philips' Appliances), a restaurant, and pool halls. Evelyn Young remembers, "At one time there were at least 15 grocery stores in downtown Millen just on Cotton Avenue. On Saturdays the whole street was filled with people, wagons, horses, and mules; you couldn’t move for the crowd. Stores wouldn’t close until the last customer left. At the back of the stores were livery stables for horses, mules, and wagons. There were three flowing wells along the street for horses and people." Dry goods stores (Jack Lewis, Delaney Dry Goods, Allied’s and Citi Trends) were there. The last occupant was a discount store. Cliett’s Bakery occupies a building dating from 1910, Mose Toole’s Furniture was a previous occupant. RSR Builders, owned by Ray Roberts and Edward Thompson, was there from 1977-2015. The bakery opened when RSR left. 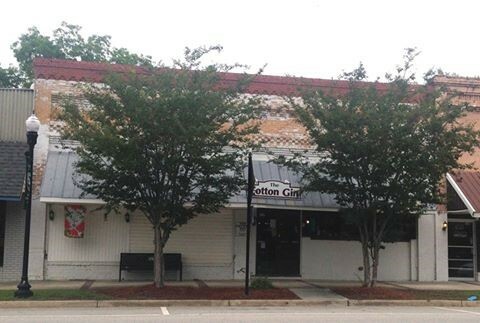 Talmadge Fries' The Cotton Gin has occupied this 1910 building since 1987. It was once Millen Pharmacy, owned by Dr. B.C. Brannen. Students bought their books there until the state issued free school books. It has also been a pool room, Millen Florist, and a part of Stephens IGA. Farmers Furniture occupies what used to be at least three different stores. The two-story building was built in 1910. First National Bank was on the end until it closed during the Depression. Other businesses on the corner after the bank closed were Rob Wood's Grocery, John Gordon Herrington's Grocery, Barney Burke's Grocery, and Zeagler's Fabric Shop. On the second level were law offices of Jimmy Nelson, Milton Carlton, and Tom Odom. George Mack Reynolds' barber shop was located on the side street in the back. Occupants of the second store front in the two-story building have been Toole's Furniture Store, owned by Richard and Picken's Toole, and McConnell's 5 & 10, an upscale dime store. 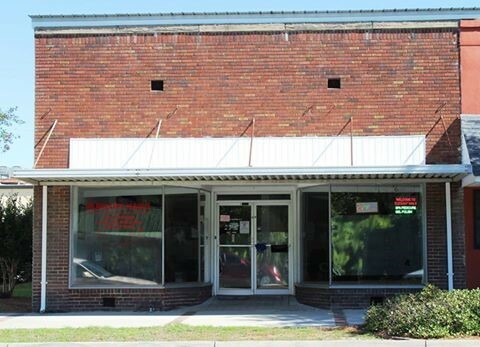 In the early 1980s, Ogeechee Valley Variety Store, owned by Dekle Phillips, occupied both sides. The one-story building was built in the 1930s. Stephen's IGA was in the one-story section in the 1950s until the 1980s. 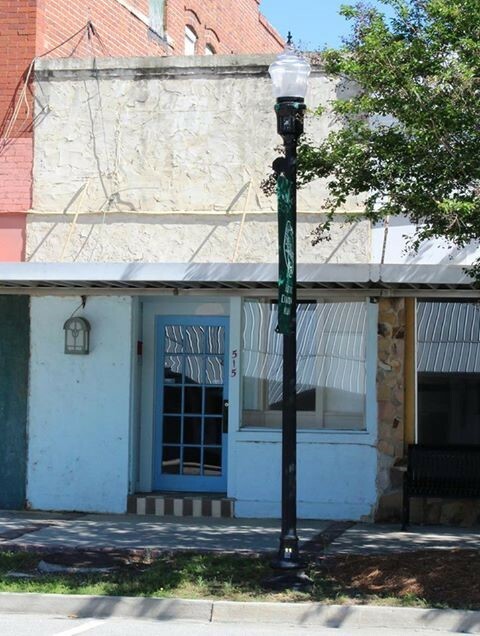 Lucretia Dickerson has two businesses located in this 1930s building, Lucretia's Beauty Salon and Millen Consignment Shop. Other businesses located there in the past have been James Lee's Grocery, Lee's Department Store, managed by Ruth Warren, the Maxwell Store before it moved to the location down the street, and Bill's Dollar Store. 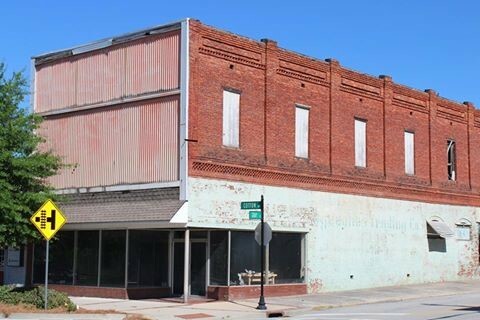 There was a building on the left side of this building that had been Tom Harper Chevrolet before World War II and has since been torn down. In the building pictured had been Christopher's Grocery Store in the '40s and '50s, and at different times, G.W. Jenkins Grocery, Roscoe Pierce's Grocery, and A.J. Jenkins Grocery. The last business to occupy the building was Harry Matthews' Western Auto. For many years after Western Auto closed, it was used for storage, and now an office is located inside. This early 1900s building was the original location of Daniel’s Grocery and Meat Market. The store opened here about 1931 and in 1947 moved to the next block east. From 1952-1955, Henry Edenfield ran Edenfield’s Grocery in this location until moving to Highway 25. 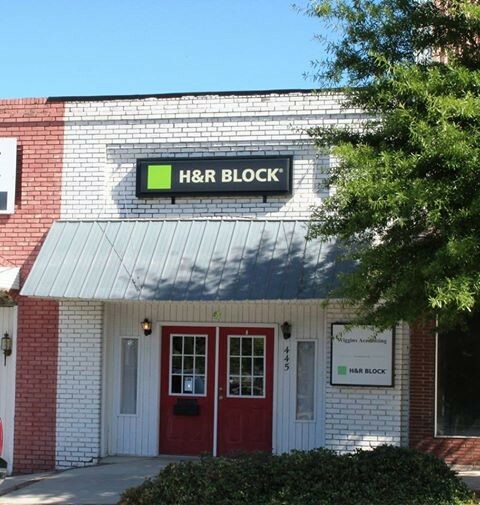 H & R Block is located here now. This 1905 building is the home of Newton's Refrigeration. It has been an auto parts store and in the 1960s and '70s was the Joy Belle Shoppe, a ladies’ dress shop, run by Mrs. D.W. Harrison. Joey Kirkland, the current owner of this 1930s building, ran Collectibles on Cotton, an antique mall, here for several years. In the past it has been home to a number of grocery stores: Charlie Reeves', Reemer Lane's, James Lee's and Tinley's. It has also been Lourie's Dry Goods and Lenora's Dress Shop. After 1968, it became part of Wilson Furniture Company. N.P. (Nick) Economos, a Greek, constructed this building in 1928 as a home and business. He lived upstairs and had a market below. Charlie Cheers restaurant was there in the ‘30s and ‘40s, and later Johnny Evans ran United 5 and Dime there. Evelyn Young recalls “While now everything is a dollar or more, about 70 years ago, you could buy most anything for a dime in a store like this one. The people who ran the store lived upstairs, which was, back then, rather customary." 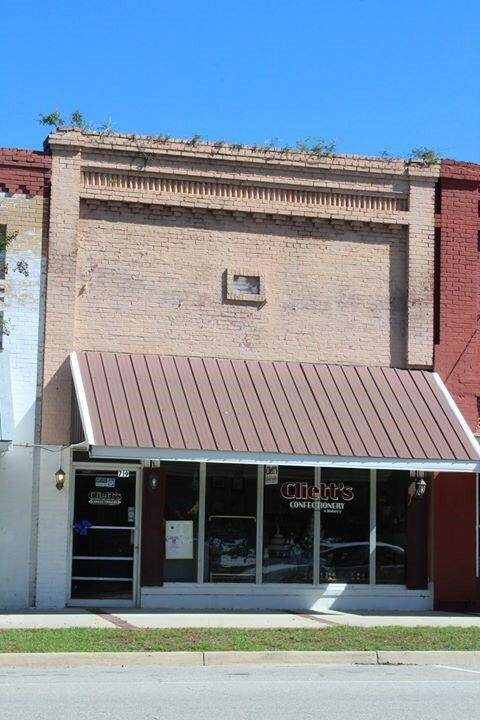 This building and the one-story building on the corner have been Dr. Lee's Clinic, Roger's Grocery Store, Kaplan's, Pioneer, Welt’s (run by Gene Tallent,), and Hatcher's Gas Company (run by Tubby Hatcher). Mary Sue Newton bought the two-story building and the one-story beside it in 1968 for the Vanity Box. The first person to open The Vanity Box was Martha Mays (Mrs. George), who in another location had a millinery shop she called The Vanity Box. The second Vanity Box owner was Ms. Dean Brinson, who opened her store next to Mills Drug Store; she sold the shop to Mrs. O.P. Long. Mary Sue Newton purchased the Vanity Box in 1965 while it was still next to Mills Drug Store. When the fire in Wilson's Furniture in 1968 destroyed her building, Mary Sue bought the Economous building and the one-story building next to it from the Gray family and moved the Vanity Box there, where she ran the business until 1987. She briefly leased the building, but reopened the Vanity Box and ran it until the late 1990s. When she closed, she sold the building to Tim Newman, who ran Rent-to-Own, Furniture Box, the Music Box, and The Little Pit. Today a church occupies one side of the building and the other side is vacant. The original building located here burned in 1969. It had been Farmer’s Hardware and Furniture, owned by the partnership of John C. Wilson, Raymond Barefield, and H.E. Thompson, formed in 1937. James Lee, who sold dairy equipment, also had an association with the business. In the 1950s, Raymond Barefield separated from Farmer’s and he and his son-in-law, Marion Reese, opened Millen Furniture Company on the corner of Cotton Avenue and Gray Street. After the building burned, Ed Wilson replaced it with the current building and continued to operate as Wilson Furniture until he retired in 2006. 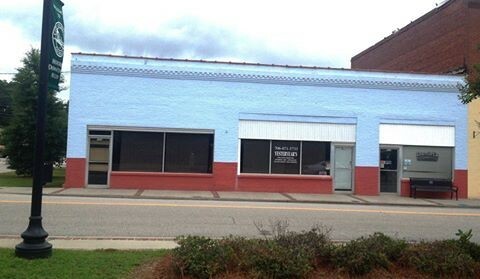 Millen Downtown Development Authority purchased the building in 2006 and currently leases it to Josh and Daniel Linder for Front Street Fitness. 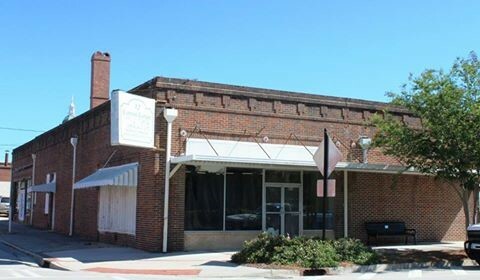 The Bank of Millen was formed in 1893 and operated in this building from 1893 until 1954 when it moved into the new building next door on Cotton Avenue. Since 1954, it has been home to Millen Café, owned by Robert and Fanne Burke, Kenwin's (a dress shop), and a loan office. The first library in Millen was on the second floor until the late 1940s. Dr. Williams, a dentist, was also on the second floor. 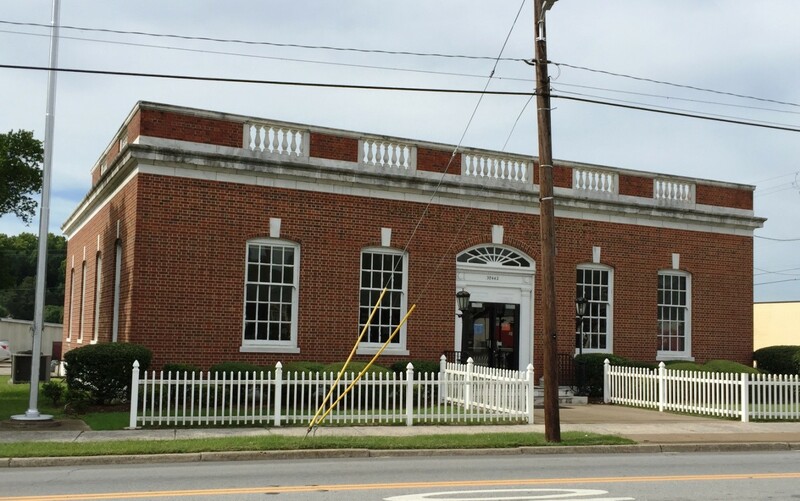 For more information on the history of the Bank of Millen, see The History of Millen and Jenkins County, Patricia Fries Hilliard, 2013. Elegant Nails is located in this building dating from 1920. Lourie’s Department Store and Hodges Department Store have also occupied this building. In 1987, Ed and Penny Wilson bought the building from Andy Hodges when he retired, and opened Ed’s of Millen. When the Maxwell Store nearby became available, Ed’s of Millen moved there. In 1994, the Wilson’s sold the building to David Adams. It was later used for Home Health Medical, and now is the nail salon. This building at 553 Cotton Avenue was built in 1920. The Charm Barn has been doing business in this location since 1995 when Lee and Leigh Ann Wilson opened the store there. Terri Reeves, the current owner, assumed ownership in 2004. Prior to being home to The Charm Barn, in the late 1930s the building was Sims Grocery (first located where Dwelle Insurance is). It has been a dry goods store, Tinley’s Jitney Jungle (until it built new store where McMillan’s Fish Market was located, and now Railroad Gun and Pawn) and General Dollar. For many years the left side of the building was the Pal Theater until the new Pal was built in the 1960s. 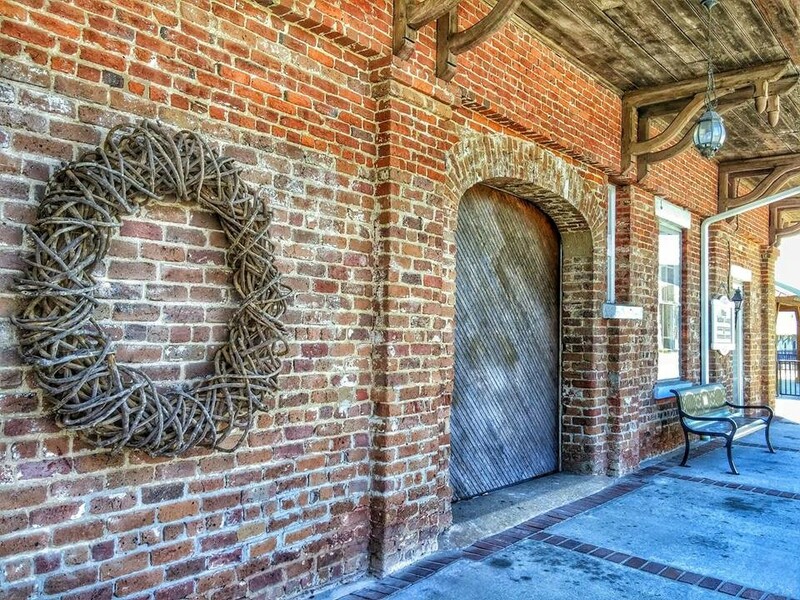 The original Charm Barn was located on the corner of Cotton Avenue and Masonic Street. It was owned and operated by Bill and Jackie Landrum from 1953 until 1992. When the Landrums retired in 1992, they leased the store to Sherri Smith who continued to operate the business as The Charm Barn in the same location until 1995. The Landrums sold the property when the new Rite Aid was built. For a more complete history of The Charm Barn, see The History of Millen and Jenkins County by Patricia Fries Hilliard, 2013. Bell's Drug Store, established in 1881, was one of Millen's earliest businesses. 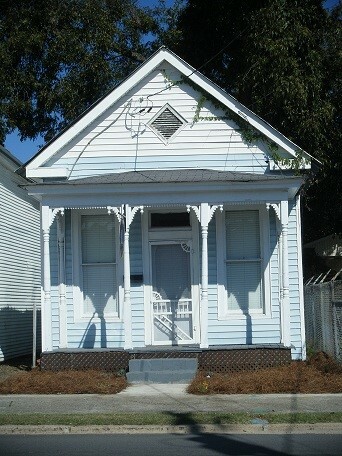 It was located in this building at the corner of Cotton and Daniel Streets. Later the building was home to Wade Drug Store, Mills Drug Store, and Cotton Corner Cafe. Originally the building was two stores with two front entrances. In the 1950s and '60s, a dress shop, "The Vanity Box," was located next to the drug store. The store owners were Mrs. Dean Brinson and Mrs. Long. In the rear of the dress shop was a beauty salon where Florine Dixon and Jem Wilson styled hair. A fire in Wilson Furniture Company next door to the dress shop damaged that part of the building, so the "Vanity Box" moved down the street. Pete Mills, who owned the drug store, took the wall out between the two and enlarged his business. He also had a soda fountain on the Daniel Street side of the building. At one time, Parker Mercantile Funeral Home was in the small offset building at the back of the store. This small building next door to Newton Refrigeration has been Tasty Bite Cafe, Benson's Jewelry, Carter's Jewelry, Hildabrant's Jewelry in the early 1980s and Jazzy's Pizza later. 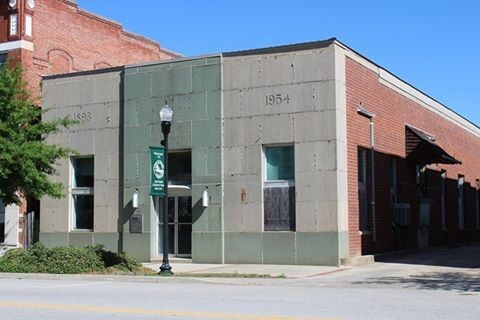 The second Bank of Millen building was built in 1954 next door to the first one on Cotton Avenue. A white wooden building that was an old boarding/apartment house had been on the property. When the third bank building was built on Winthrope Avenue in 1980, Delores Thompson bought the building. It has been used as storage since. 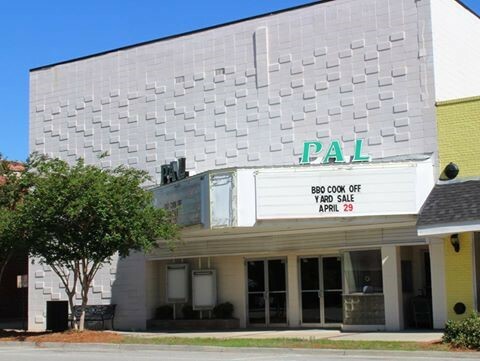 The Pal Theater and the building next door, Cafe on Cotton, are located on land where Dr. Q.A. Mulky's Hospital stood until he built a new hospital on Daniel Street where the Jenkins County Library is. There had been theaters at three or four other places in Millen before the Pal was built in its present location, probably in 1950. Millen's Pal was part of a chain of theaters in Georgia's small towns. According to Elsie James Odom, who worked at the Pal Theater in Millen from 1956 to 1960, "We had a grand opening after a renovation in 1959. It was completely renovated and increased in size with a new concession area, larger lobby, seating areas with new seats, projectors, stage, screen and a newly painted outside with bright colors." During the 1960s and '70s the theater was open seven days a week; on Wednesdays in the 1960s, admission was 25 cents. The home office for the theater company, "Pal Amusements," was in Vidalia, Georgia, with theaters in Abbeville, Glenville, Hinesville, Louisville, Lyons, Millen, Mt. Vernon, Soperton, Wadley, and other places. 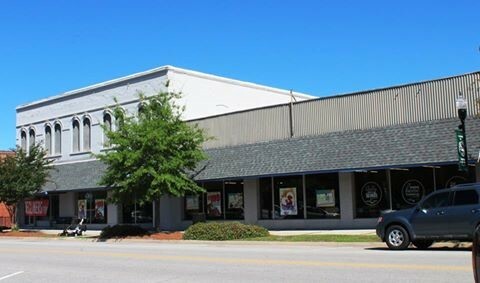 The Brice family of Vidalia owned and operated the theaters. Ms. Maybelle Wiggins of Millen started working for the Pal Theater in 1945 when it was located in part of what is now the Charm Barn. She retired in 1969 or 1970. According to Mr. Bobby Dwelle, a group of ten people purchased the present building in the 1970s. Their venture was unsuccessful. T.L. Hawes of Perkins and Joe Waters (of Joe Waters and the Mellotones) became owners. Joe and his band had shows at the Pal in the '70s and renamed the theater The Millen Opry House. Shows were still being performed in 1998. The Jenkins County Development Authority bought the building in 2000. The Development Authority made extensive repairs and improvements. In 2012, Main Street Millen restored the marquee to its original design. Thanks to the Jenkins County Development Authority, the theater is kept in good repair. It is frequently rented by local groups for performances and movies. Source of Information: The History of Millen and Jenkins County, compiled by Patricia Fries Hillard, 2013. 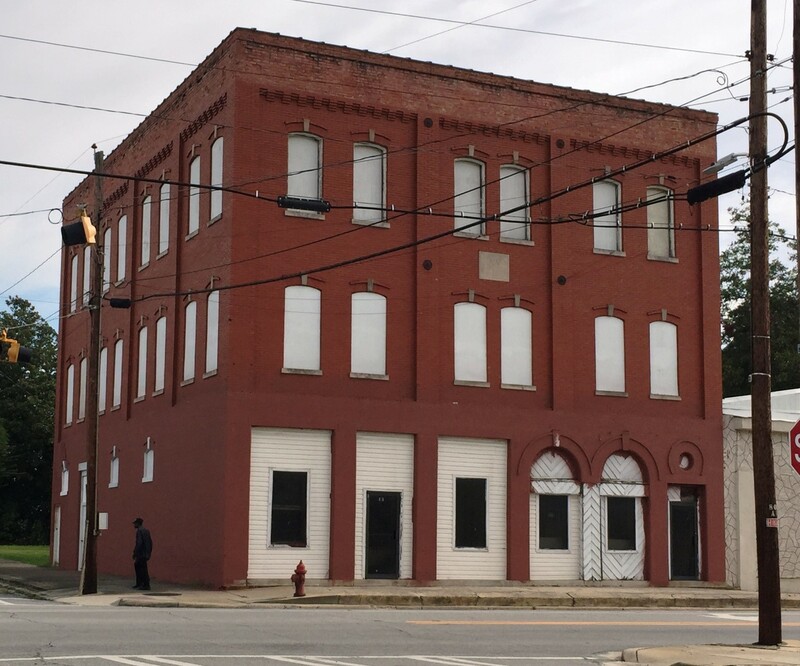 The "Godbee Building," built in 1905, was occupied in the 1940s by Gholston Drug Company. 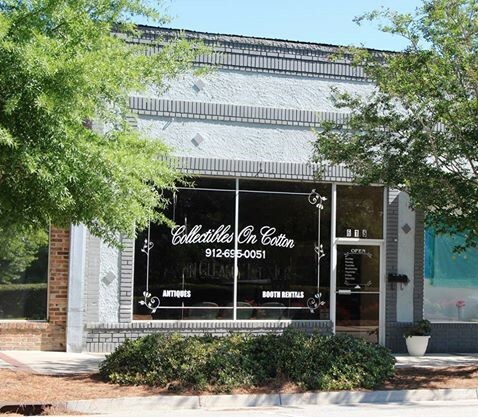 Julian Wade began working with the owner, Dr. Joe Gholston, in 1944 when he, Inez, and little Julian moved to Millen. 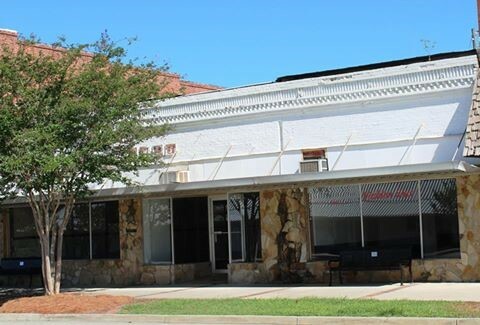 When Dr. Gholston died in 1950, the Wades purchased the store from Mrs. Gholston and renamed it Wade Drug Company. They enlarged and remodeled the building in 1957. They sold the store in December 1979 to I.P. Mills, who continued to run it as Wade Drug Company for a while. Other occupants have included Esquire Fashions and Something Pretty, a clothing store. 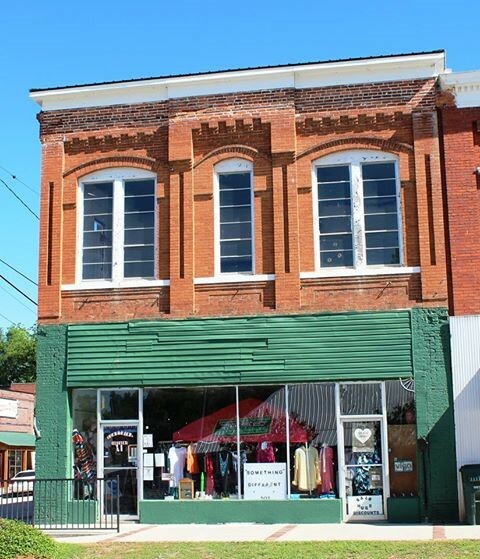 Something Different, a consignment shop, currently occupies this building, constructed in the early 1900s. In its early years, it was a mercantile store owned by Daniel's Sons and Palmer. It sold everything for farming and surviving. It was one of the few stores on Cotton Avenue that had an elevator. It closed in the 1920s. 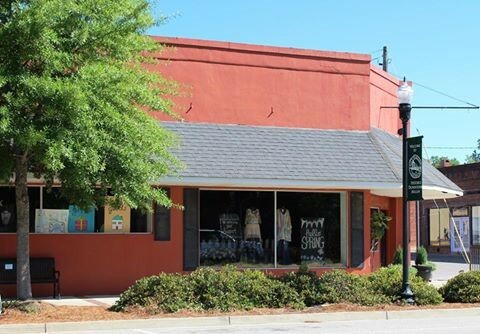 Since then, it has been Hal's 5 & 10, Brooks' 5 & 10, Kathy Lindsey's craft store, a Mexican store and restaurant, and currently the consignment shop. 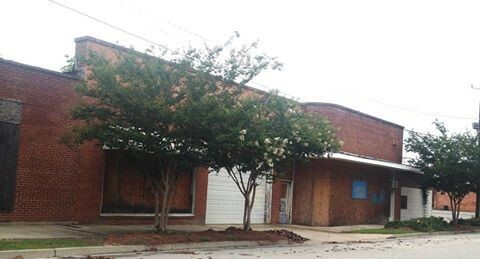 The building at 511 Cotton Avenue was the original site of Edenfield Feed and Seed Company, established there in 1939 by Irma and Gordon "Sally" Edenfield. It remained on Cotton Avenue until 1965 when it moved to South Gray Street. After the business relocated, Jean Edenfield Rountree and her husband David assumed full-time operation of the Edenfield's family business. After 42 years, Jean and David retired and sold the business to Beth and Rodney Collins, who later sold it to Bob and LaDonna Gest. The Gests eventually moved the business to Highway 25 where Edenfields Feed and Seed still operates. After Edenfield's left this building in 1965, Richard and Rita Toole put in a dress shop for a while. It was also at different times Lewis Barber Shop and Hargrove Millinery Store. 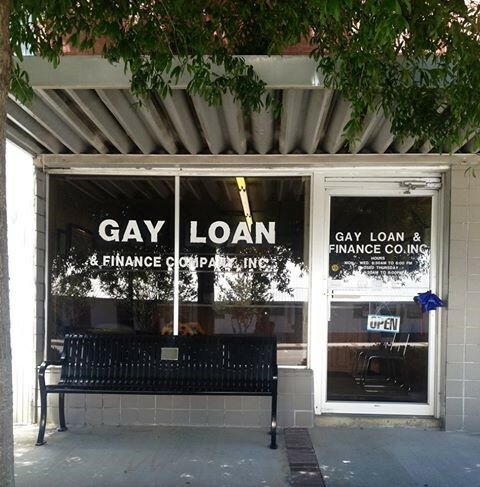 In 1972, Lamar Gay established Gay Loan and Finance there. His son, David Gay, has operated the company from 1984 to the present. 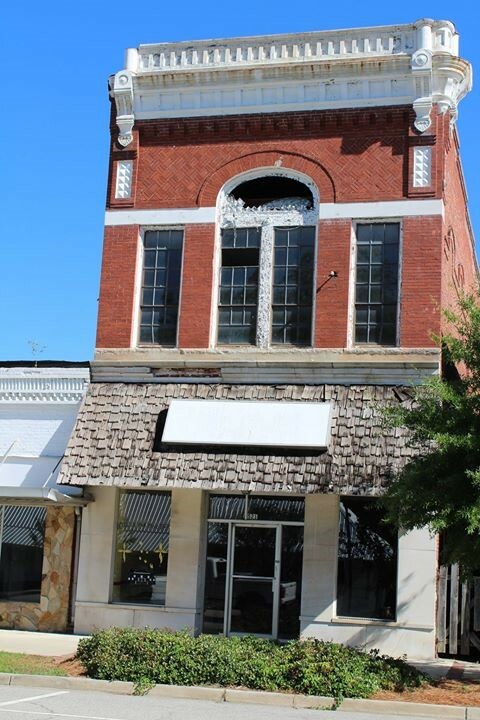 This building, known in Millen as the Opera House or the Edenfield Building, was built around 1900. 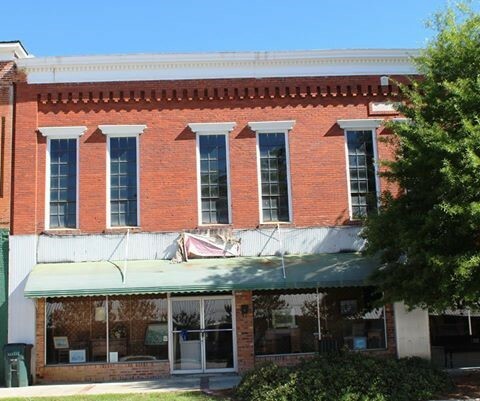 The Opera House, the last building on the east end of Cotton Avenue, is among the buildings built by Mr. John M. Edenfield, one of the earliest builders in Jenkins County. Upstairs was The Opera House, Millen's first theater, where one of the earliest movies was shown, "Birth of a Nation." It was the center of social life in the area and the site of school graduation services, dances, and many cultural activities. Traveling shows called "Rolling Operas," musicals and plays that came to Millen periodically, were performed in the large upstairs room to audiences of as many as 100 people. Shops and office spaces including Millen Grocery Company (a large wholesale grocery) and a dairy supply owned by James Lee were two of the earlier businesses on the ground floor. 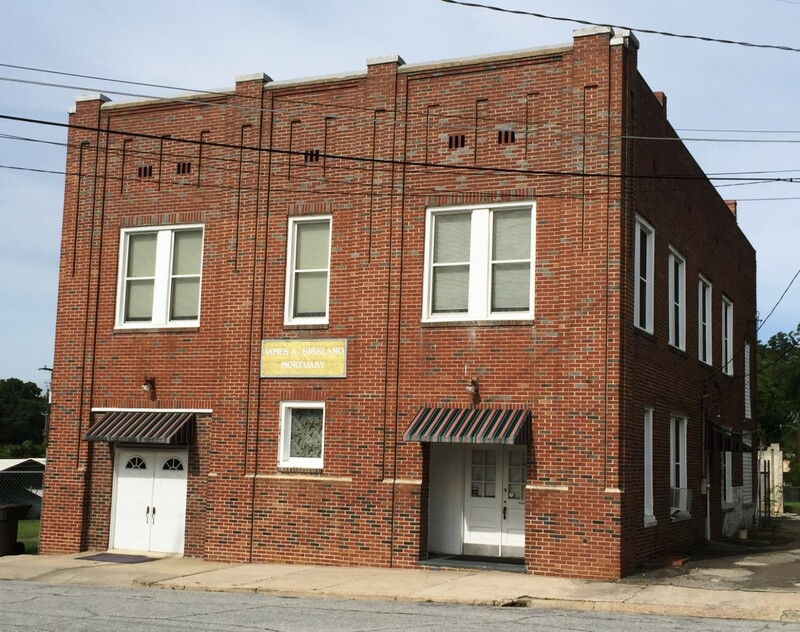 Many current Millen residents will remember some members of the 1917 graduating class whose ceremony was held in The Opera House: Walter Harrison, Irma Warren (mother of Jean Edenfield Rountree), Sidney Applewhite Weathers and Beulah Brinson. Jean Rountree, recalling seeing the Opera House when Frank Edenfield, grandson of John M. Edenfield, owned the building, says, "It was an elegant room with beautiful wood floors." The building is currently owned by Mr. Harold Moore. It retains its distinctive architectural features: the front facade is articulated with three arched openings and corresponding arched openings above the windows on the second story. A decorative cast-iron exterior stairway leads to the second floor. According to Mr. Moore, the second floor needs extensive renovation, having been damaged by a fire sometime in the past. 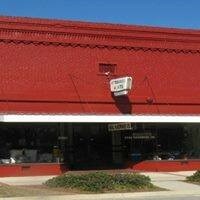 Neal Hardware, 723 Cotton Avenue, recently celebrated 105 years as a family owned business. The store opened in August of 1911. See the December 20, 2016 issue of The Millen News for a complete story about the business. 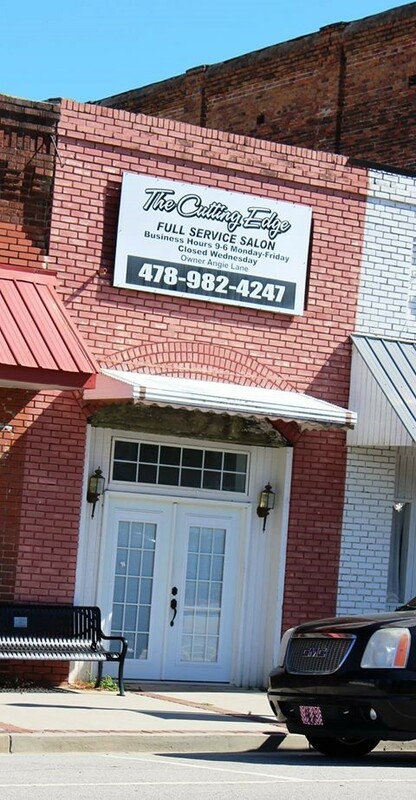 This 1908 building has been The Cutting Edge, a beauty shop owned by Angie Lane, for the past 21 years. It was once Andrew Fries’ slaughterhouse. In 1948, Corine Woods opened a fish market there where she sold fish sandwiches for several years. This 1925 building was once three separate stores. At one time Daniel's Grocery and Meats, owned by Billy and Elizabeth Daniel, occupied the left side, the Parnell Shop, a combination gift shop and plumbing business occupied the middle, and Millen Fertilizer was on the right. 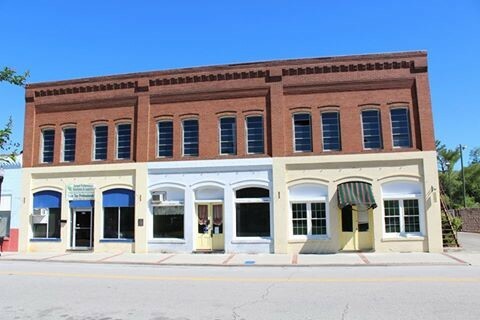 Hargrove's Millinery, Ray's Shoe Shop, and Clayton's Shoe Shop have also been occupants of part of the building. The center building later became Custom TV when Pat Johnston and his partner, Billy Dickey, opened their TV repair business. Pat eventually bought the buildings on either side of his store. When Pat retired, his daughter, Kiki Conway, opened Kiki's Hallmark Shop. The building was most recently the home of Fashion Sense. Café on Cotton is in the building that was originally Maxwell’s, a dry goods store. 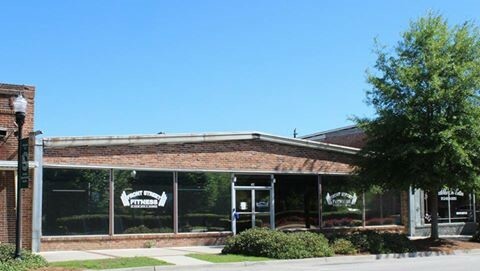 Ladson Investments constructed the building in 1950 and leased it to Mr. Lipsitz, who owned a chain of Maxwell stores in the area. Ruth Warren managed Maxwell’s for many years. Ed Wilson began working for Maxwell’s in 1960 when he was 16; he spent much of his career in this store. He went into business for himself, opening Ed’s of Millen when Hodges Department Store closed. When Maxwell’s closed, he moved his business there. Ed’s of Millen closed in 1994. 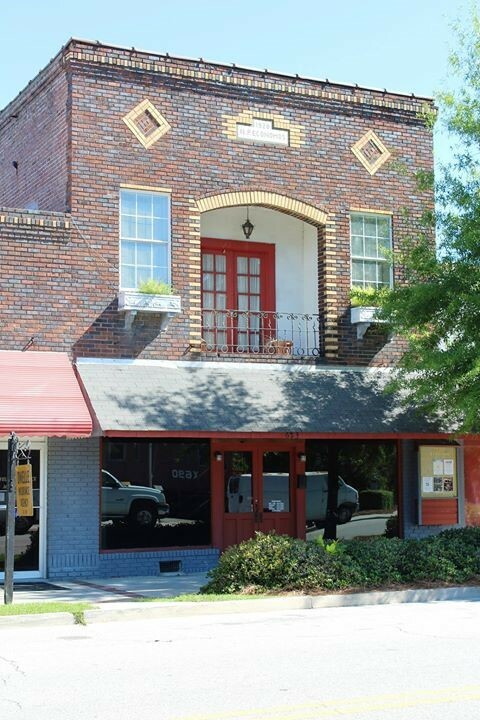 Since then the building has been a fitness center and now a restaurant owned by Amber Cates. 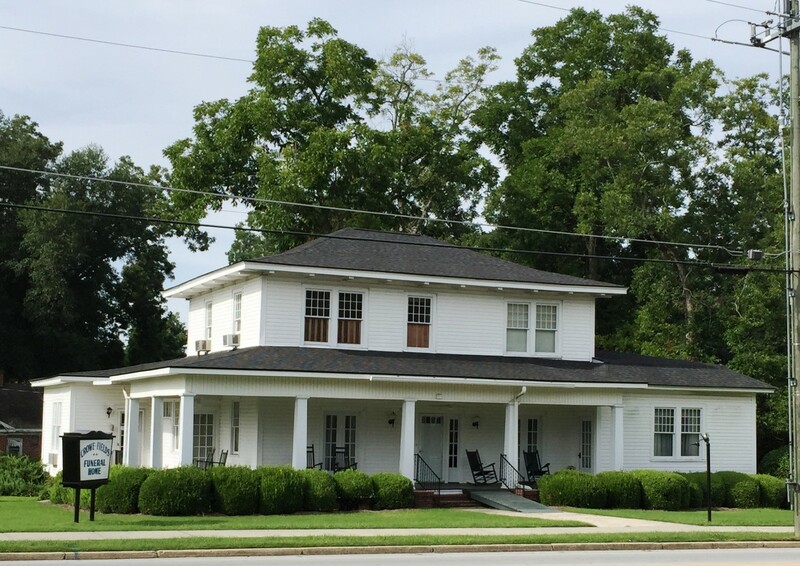 In 1937, Mr. Edgar D. Fletcher started Fletcher Funeral Home in this present location. He asked Ralph Crowe, Sr. to join the business in the mid 1950s. Robert Fields, Jr., who was 15 at the time, came to work. In the mid 1970s, Ralph Crowe, Jr., joined the staff, and after a few years, Bob Fields became part of the group. The building was constructed by John Edenfield in the late 1914 and housed the Wayside Hotel at one point in its history. The second and third floors were living quarters. A restaurant was on the ground floor. Harry and Rosalee Dwelle lived in the hotel when they got married in 1947. Hank Joyner recalls that his mother worked in the restaurant in the kitchen and as a waitress. Other occupants of the building have been a telephone office, The Millen News from 1932-1935, a furniture store, and the Department of Family and Children’s Services. The building is now vacant. 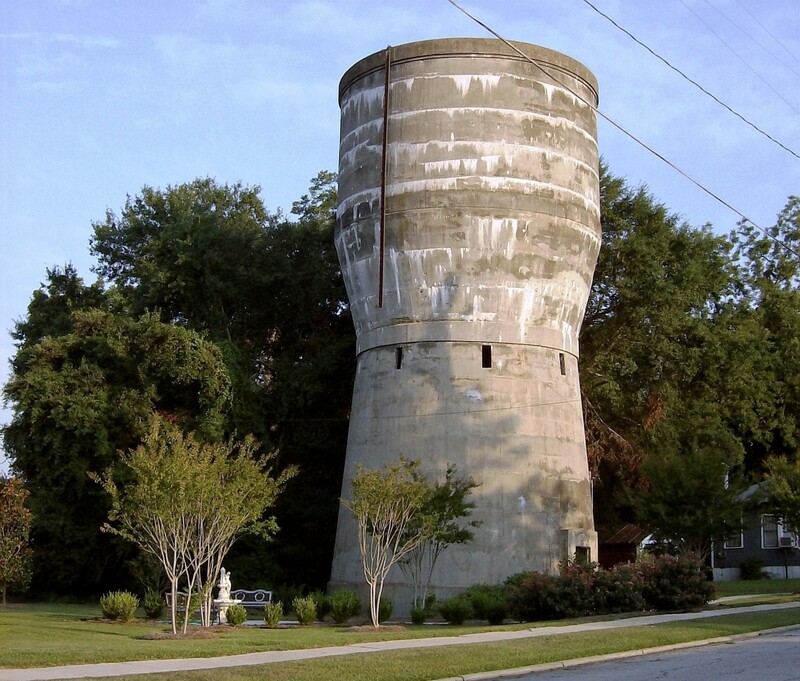 This massive 1918 water tower is constructed of cast-in-place concrete. Located near the railroad, it provided water for the steam locomotives on the Central of Georgia Railroad in the 1930s. 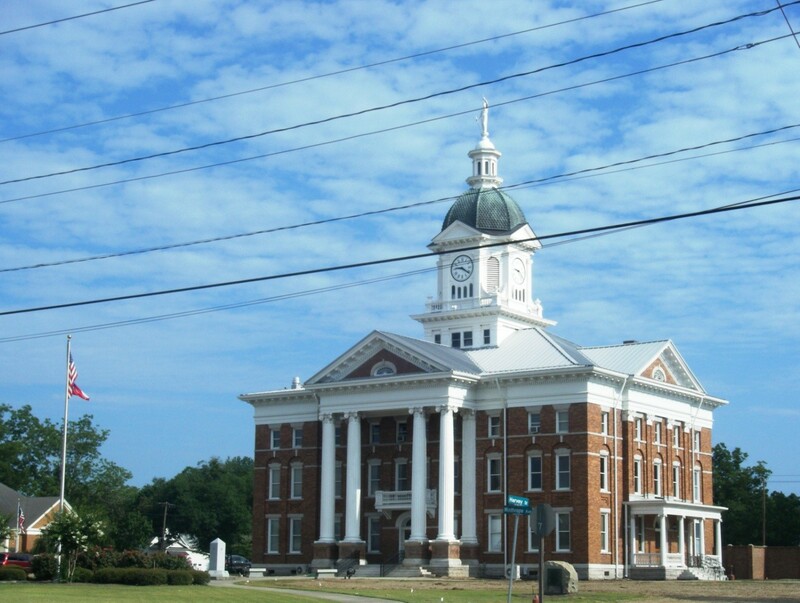 The first Jenkins County Court House was completed in March 1908 and burned in January 1910. The present building, almost identical to the first, was built in the next two years. It is a Neoclassical Revival-style building designed by architect L.F. Goodrich. It is listed in the National Register of Historic Places. A major renovation of the courthouse took place from 1977-1979. The building was gutted entirely except for the Clerk of Court’s office. The marble stairs were removed from the first to second floor and replaced with concrete. The balcony in the courtroom was removed, the ceiling lowered and replaced with offices on a third floor. The building received much needed exterior renovations from 2009-2011. The Depot, home of the Jenkins County Chamber of Commerce and Museum, is an old Central of Georgia Railroad freight depot built in the early 1920s. Of special interest are the hipped roof and knee braces. In 1981, Southern Railroad began demolition of the building. With the help of Congressman Bo Ginn, prominent local citizen Walter Harrison, and other concerned citizens, the building was preserved. The museum, opened in 1982, is open Monday-Friday from 9:00 a.m. until 5:00 p.m. The museum contains historic items donated to or on loan to the museum by Jenkins County citizens. Among the items on display are a buggy dating from before 1893, the marble plaque from Millen High School, a bale of cotton, one of the first telephones, a bicycle built for two, a printing press from The Millen News, and large pictures that originally hung in the old Bank of Millen, one depicting Angus cattle from Dr. Arnold Mulkey’s farm. 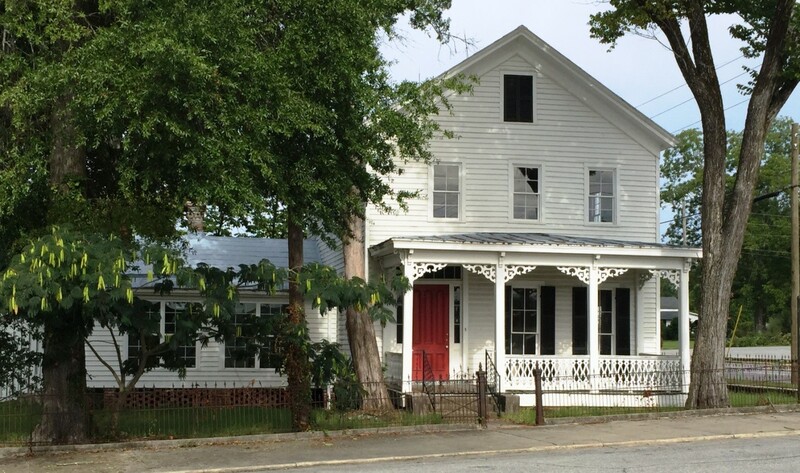 At different times, Millen has received state funds to renovate, restore, and preserve the building. The Millen Post Office was established in 1840 in what was then known as Brinsonville; the first postmaster was Martin Marsh. The post office has been located in the Southern Hotel, the Godbee Building, and the Hotel Estelle. The post office moved into its permanent and present location in 1938. The exterior trim is made of white Georgia marble. This building was built in 1888 as an office for Josiah Holland, probably by John M. Edenfield who constructed his residence. 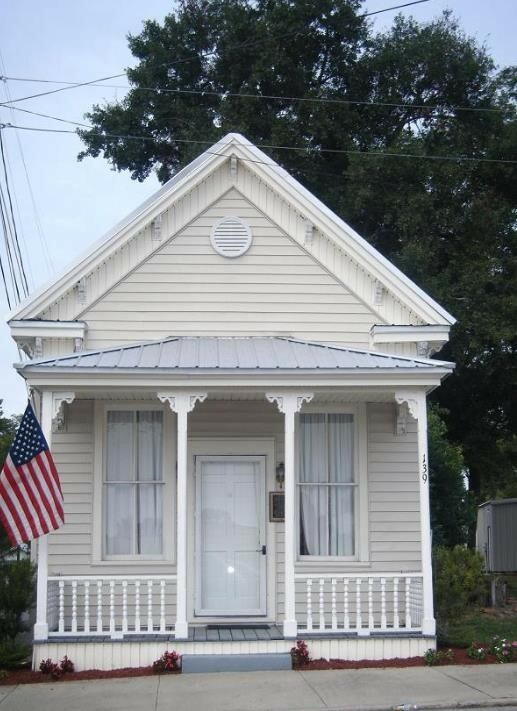 It is a one-story, front-gabled Folk Victorian shotgun with eave brackets and porch detailing. The building was used by the City of Millen as City Hall from 1928 to 1936. In 1936, the city built a new brick city hall south of this building. After the city left the building, it served as a residence for a number of families and as various businesses: a dress shop, insurance office, florist, and bakery among other things. The office is occupied presently by HS Consultant, Inc. The Holland House, built by John M. Edenfield, dates from 1872. Josiah Holland, a later owner of the house, was a Justice of the Peace and collections agent in the days before the town was incorporated. The house is a two-story, front-gabled Folk Victorian. For many years Ailene Hatcher had a gift shop in the building. Ed Wilson followed her with Ed’s Antiques. This building was built in 1936 for Millen City Hall. In 1974, the city completed a new city hall on College Avenue. James A. Kirkland Mortuary is the current occupant. The Dekle Building was built in the late 1800s. Originally it was located on the northeast corner of Gray and Winthrope but was moved to make way for the Lane Building in 1914. The building gets its name from the Dekle attorneys whose law practices were located there: G.C. Dekle, and later his son, Clyde. Later, it was Jason Williams’ real estate office. The building is now owned by George Gunn. The Lion’s Club and Main Street Millen use the building for their meetings.